STORE YOUR FOOD WRAPPERS AND BAGS in one convenient location! might find in your pantry, this basket will prove to be unbelievably useful. bathroom, office, and any other room of the house! 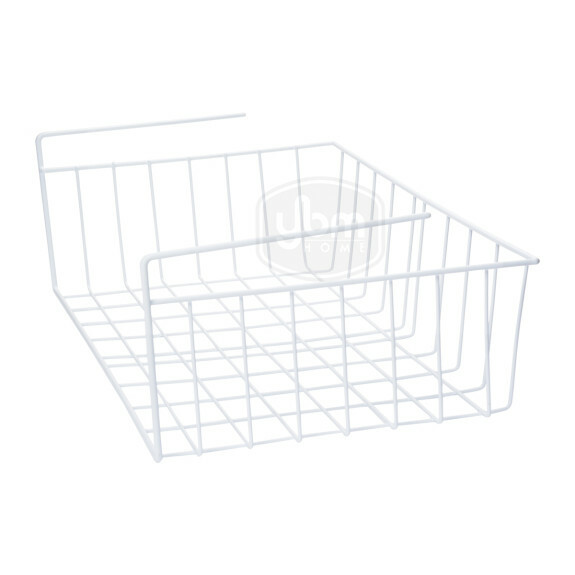 These Ybm Home sturdy wire under shelf baskets are designed to help increase your storage space. Installation is as easy as sliding the rack on an existing shelf and you are good to go! No drilling, tools, or additional parts needed! These shelves are made of Sturdy PE coated steel construction with a white coating and are designed to be both durable and aesthetically pleasing. or anything thing else that may be taking up valuable shelf space. The Ybm Home Under Cabinet Organizer creates simple and easy storage solutions throughout the home, including the kitchen. Simply slip the arms over the shelf and the basket underneath will neatly store extra utensils, place mats, dish towels or cookbooks. This versatile storage solution also works great in offices and hobby rooms to keep supplies organized. It is also ideal for linen closets to store hand towels and sheets, or in laundry rooms for dryer sheets and more. This hanging basket offers a multitude of storage options for the kitchen, bathroom, office, and any other room of the house. Dual hooks allow this basket to hang sturdily under any shelf, and wide opening makes it easy to store and remove items. Whether it's spices, jars, cans, or anything else you might find in your pantry, this basket will prove to be unbelievably useful.